As we related in our previous post, Leonia Interfaith Sanctuary City Resolution, Rabbi Schwartz joined together with the interfaith clergy of the Borough of Leonia to draft a resolution, which the Adas Emuno Board of Trustees signed onto on behalf of the congregation, urging that Leonia be declared a sanctuary city. After more than a dozen residents offered their opinions on a proposal for sanctuary city status for the borough, the mayor proposed a resolution he drafted declaring Leonia a "welcoming community." Residents filled the Borough Council chambers Wednesday night, with some supporting the idea of making Leonia a sanctuary city while others stood against it, two weeks after a resident's letter sparked debate on the subject. Some were against the status because they believed it asked law enforcement to disregard the laws of the country. Others said the borough is already a sanctuary city in practice, as officers do not ask immigration status, and therefore does not need to make a statement declaring itself a sanctuary city and risk losing federal funds, as per President Trump's executive orders on immigration. As descendants of legal immigrants, some who spoke Wednesday night said their parents and grandparents went through the long, arduous process of immigration and followed the law, and they urged the council to also follow immigration laws and not grant sanctuary status. Those in favor of the status urged compassion for the plight of refugees and immigrants, many of whom are fleeing war-torn countries and seeking better lives for themselves and their families, residents said. Some also said the borough needs to make a stand against the president's executive orders. Still others sought a middle ground between that compassion and ensuring that criminals do not find refuge in the borough and put residents at risk, suggesting the borough work with foreign embassies to identify such criminals. Mayor Judah Zeigler said he appreciated the large turnout and the diversity of opinion, adding that it is a "complicated issue." He distributed his draft to the council, and proposed that it be put on the consent agenda at the next meeting. The mayor's resolution advocates the borough's values and asserts that law enforcement officers shall not inquire about the immigration status of residents who are not being arrested for a crime, but does not include the language "sanctuary city." Zeigler said the resolution expresses his commitment to diversity and protecting the municipality's character as a diverse community. Compared to the interfaith clergy's resolution, Zeigler's compromise amounts to a much weaker statement, and comes as something of a disappointment to those advocating for sanctuary city status (although the specific provisions on the sanctuary city resolution are not as strong as New York City's, and stipulate that officers of the law and government officials should not act in an illegal fashion). Councilman William Ziegler thanked the mayor for drafting the resolution for discussion, and said that since the previous meeting, he had done research. He said he found that residing in the country without documentation is not, in itself, a crime. "We can't dispute that we're a nation of immigrants," he said. "We're stronger, better, safer and more competitive as a nation because we have a healthy immigrant pipeline." He said there would be "severe" repercussions to deporting illegal immigrants, as they pay taxes and have jobs, in addition to the pain to families pulled apart by deportation, but added there is a need to be prudent as to the security of the country. "We don't want to overreach in the name of security at the expense of sacrificing our values," he said, citing statistics that say an American is as likely to be killed by a foreigner as by a shark, and according to the Cato Institute, the odds of being killed by a refugee are one in 3.64 billion. He urged that the council go on record as respecting immigrant rights while also participating in criminal investigations, as is the government's responsibility. Councilwoman Bernadette Flaim said the council should take a stand and commended the mayor for the resolution, which she said represents what the borough is and sets it apart from the negativity surrounding the issue. Council President Maureen Davis-Havlusch said the borough gains something with the resolution as the mayor proposed, but loses nothing, as it does not limit the police in the case of criminal investigations. She added that there is a difference between civil and criminal law, as people are not asked their immigrant status in civil matters, but they are asked in criminal ones. Councilman Pasquale Fusco dissented, saying he finds the town welcoming, and as the police already do not profile or ask immigration status, the resolution is not necessary. After the council's discussion, many in the audience said they appreciated the draft. Resident Leah Roland, who wrote the letter to the council that sparked the debate two weeks ago, said the resolution "reflects the spirit" of the borough. Some still opposed the resolution, while others said they had hoped the council would go further in making a stand on the topic. Still others found the mayor's draft to strike a good balance between the two sides of the issue, affirming Leonia's diversity and welcoming nature without jeopardizing its federal grant funding by using the "sanctuary city" language. The council is set to vote on the resolution at its next meeting, on March 6. We certainly agree that the mayor's resolution is a step in the right direction, and better than no statement at all, and that it would be even more disappointing should even that lukewarm measure fail to pass. Leonia has a storied history as a town of intellectual and artistic distinction, and we hope its current leadership lives up to its legacy. At our February board meeting, Rabbi Schwartz shared with the trustees and officers of Adas Emuno that he had worked together with the interfaith clergy of Leonia to draft a resolution to present to the mayor and council a resolution to declare Leonia a sanctuary city. This comes in response to the policies and initiatives of the Trump administration (and other towns in Bergen County have been considering similar declarations). Rabbi Schwartz explained that all of the clergy were asking their congregations to sign onto this resolution as well. After much discussion and some disagreement, the board voted to support Rabbi Schwartz in this effort. 1. That we urge the Borough of Leonia to declare itself a “sanctuary city” that will ensure justice for all its residents by ensuring they receive equal rights and privileges regardless of immigration status. 2. That the Borough of Leonia in such a declaration refrain from the voluntary sharing of resources, municipal employees, and police for the purposes of investigation of immigrant legal status, unless required by law. 3. That the churches and synagogues of Leonia declare themselves as communities of welcome and support for immigrant families regardless of documentation status. 4. That the churches and synagogues of Leonia take it upon ourselves to remain informed and vigilant about immigration issues, and protest unjust and unwise enactments that exist or may arise. 5. That a Leonia Sanctuary City Sabbath be designated in which our houses of worship and civic organizations join in celebrating our commitment to justice, equality and inclusion. This past fall, Trustee Norm Rosen brought up the issue of egalitarian prayer at the Western Wall, or Kotel, to the Board. For more about the controversy, see the following article from the Forward website: With Western Wall Prayer Deal Dead, Orthodox Stake Brazen Claim to Egalitarian Area. After much discussion, a letter was drafted, revised, signed by the officers and all but one of the Trustees of Congregation Adas Emuno, and delivered (via the internet) to the Prime Minister of the State of Israel, Benjamin Netanyahu. In the national debate over immigration, it is worthwhile to remember that the status of immigrant residents is not peripheral to the Torah, but central to it. “You shall not wrong a stranger or oppress him, for you were strangers in the land of Egypt”(Ex.22:20). “You shall not oppress a stranger, for you know the soul of the stranger, for you were strangers in the land of Egypt” (Ex.23:9). “You too must befriend the stranger, for you were strangers in the land of Egypt” (Deut.10:19). “You shall not hate an Egyptian, for you were stranger in his land” (Deut.23:8). “Always remember that you were a slave in the land of Egypt; therefore do I enjoin you to observe this commandment” (Deut. 24:22). I call this the argument from “historical empathy.” Time and again, the Torah reminds us to remember. We are part of a people that refuses to forget. What is more, we are bidden to create a moral memory. After all, memory can lead to vengeance. It can lead to the oppressed becoming the oppressors. That is a very natural tendency, and history is replete with such examples. The Torah goes out of its way to argue the opposite. Our historical experience should make us more empathic, not less, to the refugees who seek asylum on our shores. Perhaps this is why so many Jews have felt so aggrieved and outraged at the recent presidential executive order halting the admission of some refugees to our country. We know so well what it is like to flee oppression and persecution. We know what it like when the gates close. We know that our heritage demands that we act otherwise. We were strangers in the land of Egypt. We know that applies to a time and place in the formative period of our history, but that it also applies to so many times and places throughout our history. That this executive order was handed down on International Holocaust Remembrance Day is a painful irony. As of this writing the presidential executive order has been temporarily halted by a federal judge. Whatever its ultimate verdict in the court of public law, this order should be struck down in the court of public opinion. As Jews we are responsible for the “Judeo” in the Judeo- Christian values we herald in guiding our country. Our history and our heritage summon us to lead the way. 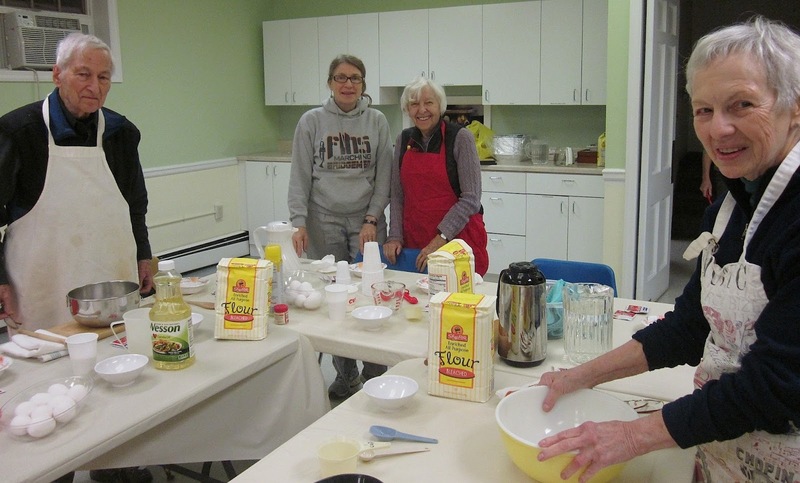 Challah Baking Workshop A Great Success! Our challah baking workshop back on December 13th was a great success by all accounts. A delicious evening, to be sure! Congregation Adas Emuno is a Reform synagogue and member of the Union for Reform Judaism, and our rabbi, Barry Schwartz, is a member of the Central Conference of American Rabbis, so it seems only appropriate to share the following press release dated January 28, 2017. 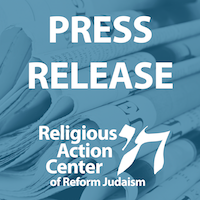 It can be found on the website for the Religious Action Center for Reform Judaism, entitled Reform Movement Denounces President Trump's Executive Order Barring Entry From Several Muslim-Majority Countries. Whether you agree with this statement or not, it is important to be aware of the position taken by the national organizations that we are affiliated with, and that represent our movement. “The Reform Movement denounces in the strongest terms the horrifying executive order on immigration and refugees issued late Friday evening by President Trump. The order signed yesterday is even worse than feared, barring entry of all Syrian refugees, imposing in essence a religious test for entry to the U.S., and refusing entry to any individual coming from a list of majority-Muslim nations–betraying even those individuals who have supported our nation's military efforts in Iraq, Afghanistan and elsewhere. Families are now being held apart and countless individuals who have served our nation in the most difficult circumstances are in jeopardy.